Akrotiri was first constructed in the mid-1950s to relieve pressure on the main RAF base on the island, RAF Nicosia. In the aftermath of the Egyptian repudiation of the Anglo-Egyptian treaty, British forces had to be withdrawn from the Canal Zone in Egypt. After the ending of the League of Nations mandate over Palestine in 1948, the only other British territory in the eastern Mediterranean was Cyprus. Consequently, the withdrawal from Egypt caused an enormous build-up of forces in Cyprus. This period also coincided with the outbreak of the internal security problems of EOKA in Cyprus, further increasing pressure on the RAF airfields on the island. Nov 1953: Administrative Staff Officer, HQ Middle East Air Force was Air Commodore J D Melvin (33170) James Douglas b: 20 Feb 1914 r: 6 Mar 1961 as Air Commodore James Douglas Melvin d: 7 Nov 1987 CB – 31 May 1956, OBE – 12 Jun 1947, MiD - 2 Jun 1943. Even this massive influx from Egypt was not the end. In late 1956, relations between the United Kingdom and Egypt had reached crisis point. The Suez Crisis saw a further increase in the strength of RAF forces in Cyprus. Akrotiri was mainly a base for fighter, photo reconnaissance and ground attack aircraft. Its regular squadrons of Meteor night fighters, Canberra photo reconnaissance aircraft and Venom ground attack machines were reinforced by further Canberras and by Hunters from Fighter Command in the United Kingdom. The airfields in Cyprus were so overcrowded that there was a real fear of massive loss of equipment should the Egyptian Air Force decide to attack the island. Fortunately for the RAF, that attack never came. The overcrowding even extended beyond Cyprus. Significant RAF units from Bomber Command were deployed to RAF Luqa in Malta, crowding that station as well. Location of RAF Akrotiri within the Western Sovereign Base Area.The attack on Egypt was a military success, despite interference in the plan which reduced its effectiveness. However, it was a political fiasco. The United States put considerable pressure on the United Kingdom and France both economically and politically. This forced the Eden government quickly from power. The quickness of the climbdown was good news for the men at Akrotiri. The station's complement quickly returned to normal after the crisis passed, with the reinforcing units that had crowded it during the war returning either to the United Kingdom or to other parts of the Middle East Command. After the Suez Crisis, the main emphasis of life on the airfield shifted to helping quell the EOKA revolt and training missions. After the withdrawal from both Egypt and Iraq, and débâcle of Suez, it was clear that a command centred on Cyprus could not control units stationed in the Arabian Peninsula, of which there were still many. Consequently, the Middle East Command was split, with that east of Suez being controlled from Aden, and the rump being renamed the Near East Command, controlled from Cyprus. Akrotiri, along with Nicosia, assumed a very important status, as virtually the sole means for projecting British airpower into the eastern Mediterranean, outside of aircraft carriers. In 1960, independence was granted to Cyprus, with the RAF maintaining both RAF Nicosia and RAF Akrotiri as bases, controlled by the Near East Air Force. However, Akrotiri assumed more and more importance as Nicosia was used for greater and greater amounts of civil aviation traffic. 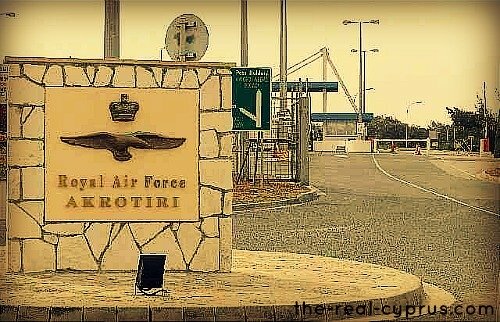 After 1966, it was no longer possible to maintain RAF units at Nicosia due to pressures of space, and so Akrotiri became the only RAF flying station left on the island. Up until 1974, Akrotiri had a balanced force of aircraft assigned to it, even including Vulcans from RAF Strike Command, to support the Central Treaty Organisation, one of the three great anti-Communist mutual defence pacts signed in the early days of the Cold War. However, during that year, Turkish forces invaded Cyprus in connection with a Greek-sponsored coup. The UK then evacuated most of its air forces from Akrotiri as the CENTO treaty had degenerated to the point of uselessness. What was left at the base is the flying unit that is permanently assigned to the base to this day; No. 84 Squadron, a search and rescue unit flying helicopters. In the mid-1980s, the US launched retaliatory attacks against Libya after the country's leader, Muammar al-Gaddafi, was implicated in terrorist attacks against US military bases. Although the bombers were staged out of the continental US, the RAF base was employed in the role of an alternate in case of emergency, and was used as such by at least one aircraft. This caused a severe upgrade in security around the base as Libya threatened to respond against locations used in staging the attacks. The threat was never carried through, and eventually the enhanced perimeter guard was stood down. Akrotiri has played a crucial role during Britain's recent operations in the Middle East. During both major campaigns against Iraq, in 1991 and 2003, and also during the no-fly zone operations between, it operated as a staging post for British forces en route to the region. A constant problem of airfields located outside the territory of the country whose forces are based there is that of overflight rights. The UK has a treaty with Cyprus that guarantees British access to Akrotiri in any circumstances. Under the treaty, the bases employ many locals and contribute to the local economy. A sizeable over-the-horizon radar antenna was erected within the base raising concern for the effect on local wildlife and on the health of people living in nearby Limassol. Several demonstrations and protests took place, with most memorable incident the act of MP (MEP since 2004) Marios Matsakis to chain himself on the antenna. Amateur radio operators report that the radar is causing interference in bands allocated for amateur radio use by the ITU. From the international amateur radio union region 1 monitoring system news letter (April 2002): The lowest frequency was 18000 kHz, the highest frequency was 29050 kHz. The bandwidth is normally 50 to 60 kHz, the signal strength S9 + 70 dB thus causing very harmful interference to the Amateur Radio Service. Akrotiri is also the location of the main transmitter of the well known numbers station, the Lincolnshire Poacher. Due to the station's relative proximity to the Middle East, it is often used by British allies when needed, such as for casualty reception for Americans after the 1983 Beirut barracks bombing and as a staging post before heading into theatres of combat in the Middle East/Persian Gulf theaters. USAF Lockheed U-2 "spy" aircraft are also permanently based at the station. The American aircraft were used in Operation Cedar Sweep to fly surveillance over Lebanon, relaying information about Hezbollah militants to Lebanese authorities, and in Operation Highland Warrior to fly surveillance over Turkey and northern Iraq to relay information to Turkish authorities. These flights were the topic of acrimonious diplomatic cables between British officials and the American embassy, later leaked by Wikileaks, with David Milbrand saying that "policymakers needed to get control of the military". The British were concerned that the flights over Lebanon were authorized by the Lebanese ministry of defense rather than the entire cabinet, and that the intelligence so gained could lead to the UK being complicit in the unlawful torture of detainees. After warnings that these issues "could jeopardize future use of British territory", John Rood, a senior Bush administration official, and Mariot Leslie, the Foreign Office's director general for defence and intelligence, became involved. Leslie said that the U.S. was not actually expected to check on detained terrorists, but that future spy missions would require full written applications. In July 2006 RAF Akrotiri played a major role as a transit point for personnel evacuations out of Lebanon during the 2006 Israel-Lebanon conflict (see International reactions to the 2006 Israel-Lebanon conflict and Joint Task Force Lebanon). Akrotiri is also the winter training grounds of the RAF display team, the Red Arrows. This video is quite something, it is filmed from the inside of the cockpit. Brilliant footage and a nice soundtrack, you will feel like you are there. We have seen the red arrows many times and never tire of seeing them practicing out over the mediterranean sea. If you visit Cyprus between March and May you will usually see them. Sometimes they come out in January too. If you are a serving in the forces or ex-personnel then you may be interested in the RAF Museum at Akrotiri which brings alive the text that has been written above. You can how the base has evolved since it first opened right up to operations for the present day. I promise to use it only to send you Postcard From Cyprus.